The art of the book may be fading in the digital age, but the Sketchbook Project now in brief residence at the Goat Farm proves that the book will always be around. The feel of a book in one’s hands is different from the feel of a Kindle or Nook or iPad. Yet the book’s unique feel is not easy to define. I have heard several literary people with great nostalgia for the book reach a kind of verbal brick wall when they begin to describe why they want to hold a book in their hands. Maybe it’s because the book has been around for a long time, and we have taken it for granted. While the book seems to be under threat from electronic readers, it would seem useful to understand and describe in words what the value of the book is. The simple, handmade books of the Sketchbook Project are of use in this effort. The organizers of the Project provide the blank sketchbook, a small thing of simple paper, though the artist is really only restricted to the format size, not the material. All are invited to participate, so anyone with $25 becomes an author. Samples are available from around the world. When you look inside the finished sketchbooks, you see a bursting of energy that seems to be propelled by the very limitations of the small, paper format with its repeated pages, its center-fold, its front cover and back cover. In Decatur artist Shari Moore’s “Creatures! 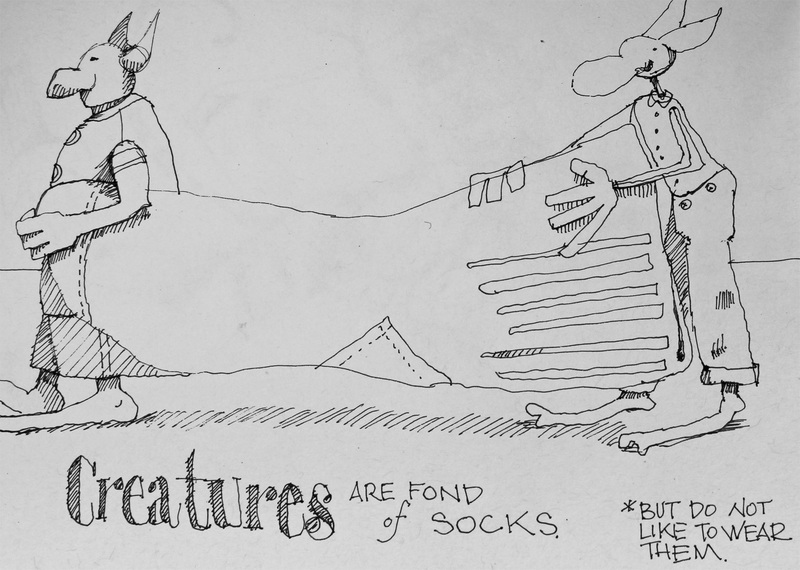 Observations,” each page is filled with a carefully composed pen-and-ink drawing of one or more whimsical characters and humorous text. The bareness, the suggestiveness and the simplicity of the well controlled lines allow for beautiful interactions between the artist’s imagination and that of the reader. Imagination and ink on paper—it’s a kind of purity at play. 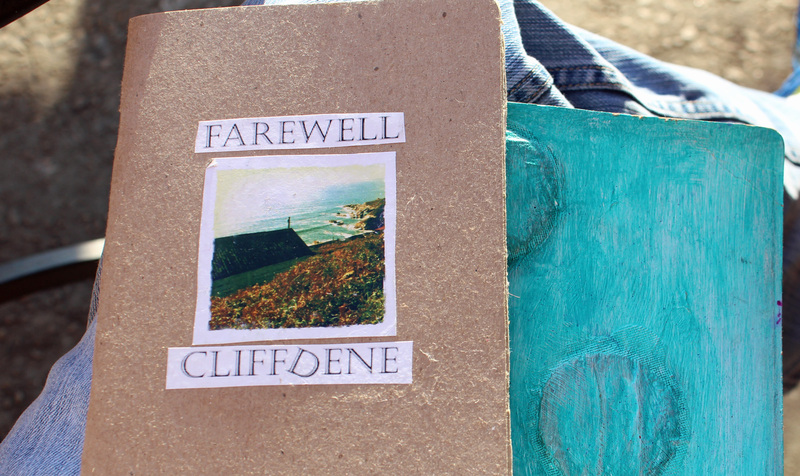 British artist Gareth Watkins’ “Farewell Cliffdene” provides a similar pleasure, with affectionate drawings of a beloved chalet on a cliff in Dover, along with photographs. Watkins’ work also contains examples of the purely tactile potential of the book, as it contains remnants of wallpaper and other bits of the chalet, whose demolition is mourned. In touching this one, you’re really touching part of Dover and part of Gareth Watkins himself. 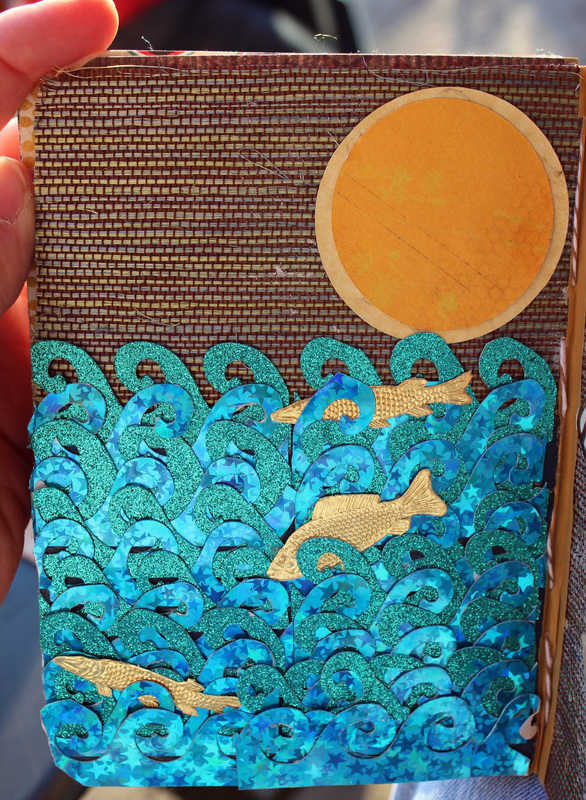 Mary Blaney of Michigan takes the tactile potential of the book even further, filling “Dream of Creatures” with thick animal shapes, beads, and all manner of glued in, glittery cut-outs. What about words? In the eight samples I viewed from the Project’s traveling library, I didn’t happen upon the wordy artist. Did the Goat Farm’s goats eat them? We’ll have to return in search of more words. From what we did see today, it’s apparent that the book is so rich with potential and challenge, and also with cup-and-saucer simplicity, that it can’t help but survive and thrive. The Sketchbook Project, presented by MASS Collective and Goat Farm Arts Center, is on display at the Goat Farm through March 17. See also http://www.sketchbookproject.com. This entry was posted in Art in Atlanta, Uncategorized and tagged Books, Drawings, Goat Farm Arts Center on March 16, 2013 by Bryan Alexander.